While the “paper” based skills of Finance professionals are crucial to success – thorough knowledge of the trade learnt through studying a professional qualification – other core skills such as focus and attention, sound decision-making, and good team and client collaboration are also vital. But what’s become more apparent in recent years is that many of these essential capacities can corrode under stress or neglect, when the mind is not properly looked after. Stress often runs parallel with a distracted state of mind, and a distracted mind often operates on “autopilot”. Have you ever had a conversation with a colleague and not been able to remember a word of it, or driven somewhere in your car but not been able to remember the journey? If so, the chances are your mind was ruminating on a problem, and rumination is the mechanism that sets the cycle of stress in motion. When you’re working in Finance or Accounting, you need to be at the top of your game all the time – to check those figures and processes are carried out correctly, or someone could be liable to get into a lot of trouble. But when you’re under stress, you may not be able to focus as well, you may make more knee-jerk decisions or lack the sensitivity required to deal with tricky situations. Recognising being in this situation can be difficult, but being able to talk about it even more so. Even today, with mental health more prominent than it’s ever been, staff are unlikely to feel able to talk to their line manager about stress for a great variety of reasons, and businesses are therefore often blind to stress levels within their workforce. But things are changing. 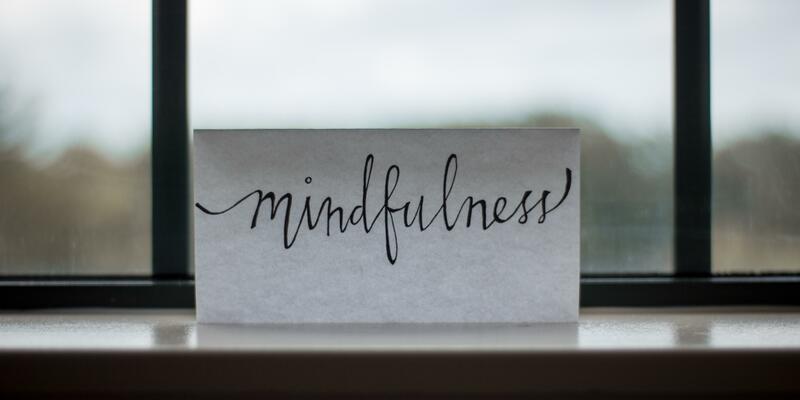 There has been a noticeable increase in recent years of organisations investing in mindfulness training to primarily support employee well-being, but also influence staff learning and development, and customer and staff engagement and retention. Mindfulness is our natural capacity for full, purposeful attention to the task at hand and can help an individual function at their peak effectiveness – get in their “zone”. Being comfortably immersed at work can lead to a sense of satisfaction and optimal performance with less risk of burnout. Thankfully, as more research into this area is published, the easier it becomes to learn how to cultivate and hone mindfulness skills through practice. For example, meditation helps build brain “muscle” to sustain a mindful state even through difficult and stressful times. It develops resilience and broadens an individual’s repertoire of psychological, behavioural, and interpersonal responses that may need to be applied in any area of being an accountant. Indeed, making sound decisions is vital for many accountants, but the repercussions of some decisions are not always clear. While various areas of business can sometimes lead us to question our own ethical boundaries, working in Finance perhaps comes closer to this more than others. As financially, target or reward driven people, it can be tempting to cut the odd corner to make the figures add up as you want them to. Sometimes this can be done absolutely harmlessly, but such actions can affect your mind and focus, or put you in risky territory. The CFA recently published a great in-depth resource on ethical mindfulness for Financial Services professionals, enabling them to find a happy place between the demands of their job and personal values. For those working at a more senior level where risk calculation and management may be integral to your role, this excellent paper published by ICAEW is well worth a read. When your responsibilities and decision-making have a big impact on your business and hundreds of people that work for it, you need to look after your mind to be in the best position possible to make good decisions. Be the best “you” you can be.